Please read a sample of one of our weekends. "We arrived lunch time on Saturday, and we were taken to place our bags in our rooms. Then we had some soup and crusty bread, before we were told, we were going to do some sailing. So we all got given instructions and were shown around the boats, how to raise the sails and how to use the tiller. We got all of our safety equipment and water proof clothing on and got ready for our sailing. Everyone thoroughly enjoyed sailing which was from one o'clock to about five. Then we had our dinner and relaxed in the centers bar, before going to bed, and looking forward to the next days sailing. When we woke up, we were warmly greeted to a fantastic cooked breakfast, while we all talked eagerly of the day sailing! 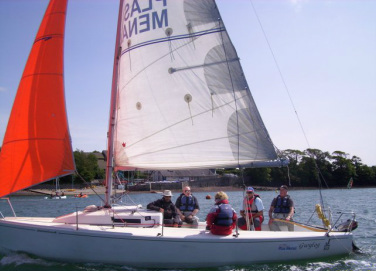 Then we geared up, and braced ourselves for the exiting day on the Menai straights! We sailed with the winds in our sails and faces only stopping for a packed lunch. Afterwards, we sadly dragged ourselves wearily off the boats, and at about four o'clock we went home, talking to eachother about the exiting events we have expierienced over the weekend."